Festus Keyamo is still insisting that WAEC certificate is not needed for any Nigerian to contest as President or Governor. 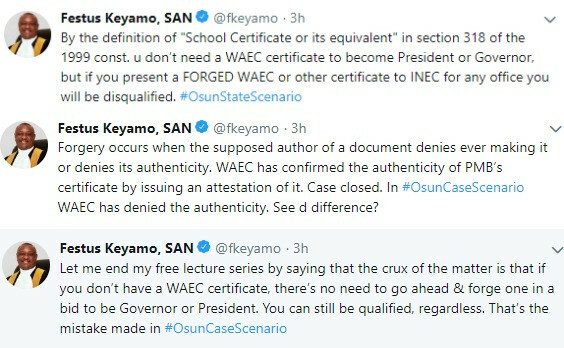 Taking to his twitter handle to expatiate on his position, Keyamo said that a governorship or presidential candidate can only be disqualified if he or she presents a fake WAEC certificate to INEC. Dancing senator and Davido's Uncle, Ademola Adeleke, is currently standing trial in court for allegedly presenting a fake WAEC certificate to INEC when he ran for the governor of Osun state in September last year.